In our earlier article, we presented the report on the presentation of Sansad Ratna Awards 2013 by Mr T S Krishna Murthy, Former Chief Election Commissioner of India in the presence of Dr K. Rosaiah, The Governor of Tamil Nadu. To coincide with the Award function, Prime Point Foundation, jointly with Department of Humanities and Social Sciences, IIT Madras organised a National Seminar on politics, democracy and governance. This seminar included three sessions, including one session on Indian Parliamentary system by PRS Legislative Research and two panel discussions. 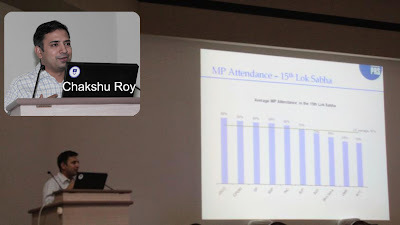 Chakshu Roy of PRS Legislative Research, Delhi made a presentation on the Indian Parliamentary system and the functions of the Parliament. He also explained as to how media and public can track the the performance of legislators. The presentation is given below. Six Award winning MPs Anandrao Adsul, S S Ramasubbu, Arjun Ram Meghwal, Hansraj Gangaram Ahir, Rama Devi and Dr Jhansi Botcha Lakshmi were invited to be the panelists to share their success stories. These MPs shared their work procss to achieve this level. The topics like disruption in parliament, linking of rivers and other nationally important issues were discussed. They also explained as to how the raising of questions and participation in debates help to get the advantage for the people. The programme was anchored by Susan Koshy and V Rajendran translated the Hindi speeches into English. Another panel discussion with various political leaders of Tamil Nadu and socially conscious persons was held in the afternoon. The entire proceedings were held in Tamil. Ms Bhanu Gomes anchored the discussions. The true meaning of Indian politics based on Constitutional democracy, possible hurdles for a new political entrant, qualities for a new political entrant, political parties reforms, electoral reforms, Political parties' selection of candidates , Parties' ideologies, Media's role in democracy, paid news problem in Media, Must-have changes in Education system, muscle power& money power in politics, high cost of elections, problems in policy making, problems in implementation, decentralization of power, Women' safety in politics, Women's Bill were all discussed. Youngsters from different parts of Tamil Nadu participated. This National Seminar and Sansad Ratna Award function was supported by Indian Overseas Bank (Gold Sponsor), Bank of Maharashtra (Silver sponsor), Corporation Bank, UCO Bank and Chennai Petroleum Corporation Ltd (banner sponsors). The professional handling of Dr Sudarshan, Sasi and their team in various departments of IIT Madras made the event a grand show. On behalf of Sansad Ratna Team, Susan, Rajendran, Bhanu, Abdul Gani, Pradeep, Kannan, Sukruti worked tirelessly planning every minutest details. Participation of the Governor of Tamil Nadu, six award winning MPs, senior political leaders from different parties with a constructive discussion added the credibility of the Sansad Ratna Award. The Sansad Ratna Awardees carried a pleasant memory of this event and motivated them to excel their own performance in the days to come. The photos of the entire event may be seen from here.